Kevin Curtin/Austin Chronicle/January 22, 2019 – Punk icons, big name scions, viral rappers and more top the talent for this years’ AMAs. 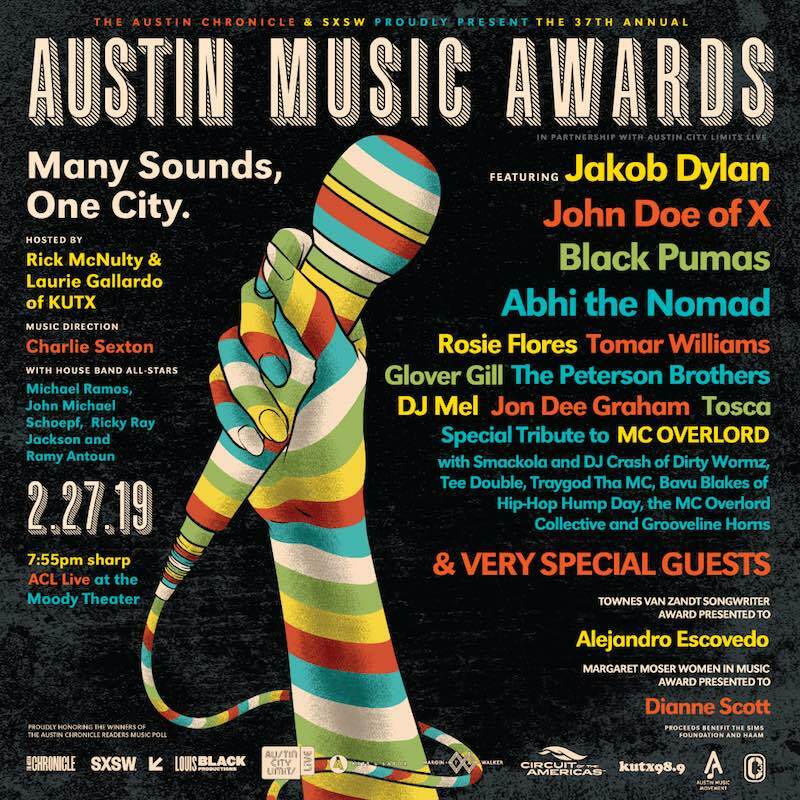 Proclaiming “Many sounds, one city,” Austin’s big, busy, boundless music scene comes together at the Austin Music Awards on Feb. 27 at ACL Live at the Moody Theater to celebrate winners of the Austin Music Poll. Breakout MC Abhi the Nomad, Black Pumas, now-local punk legend John Doe, and topline ringer Jakob Dylan lead the homegrown talent and tributes. In the former department, look for soul powerhouse Tomar Williams, whose group Tomar & the FCsreceived a nomination for “Best Blues/Soul/Funk”; in the latter category, prepare to honor seminal Austin rapper MC Overlord, aka Don Robinson, who died unexpectedly in September at age 49. Paying their respects are Bavu Blakes, Traygod Tha MC, Tee Double, Smackola, and the Grooveline Hornsperforming MC Overlord’s music. Spoon frontman Britt Daniel will be on hand to present the Townes Van Zandt Songwriting Award to fellow Austin legend Alejandro Escovedo. Beloved scene fixture and supporter Dianne Scott takes home the Margaret Moser Women in Music Award, presented by her Continental Club compatriot Steve Wertheimer. Last-minute addition Suzanne Vega joins the presenter pool as well. The lineup, reflecting the broad tastes of Austin music fans, also features rockabilly godmother/shredder Rosie Flores and tango pianist/accordionist/composer Glover Gill, who is coming out of his recent retirement for a special performance that also features Tosca and Jon Dee Graham. Famous for being President Barack Obama’s preferred song selector, DJ Mel spins while ATX blues-prodigy combo the Peterson Brothers funk. Per tradition, a super special guest performer will be revealed on the day of the event – one who routinely sells out local venues large and small. For now, we can announce that Charlie Sexton will fulfill year five of his ill-advised lifetime contract as the event’s music director. Meanwhile, the AMA House Band features local blue-chippers Ricky Ray Jackson, Micael Ramos, John Michael Schoepf, and Ramy Antoun. Once again, the extravaganza comes hosted by dynamic KUTX duo Laurie Gallardo and Rick McNulty. As a nonprofit, the AMAs fundraise for two fellow nonprofits that work year round to keep Austin musicians healthy and safe, both of them indispensable: HAAM and the SIMS Foundation. Celeste Quesada and Louis Black Productions are producing the event. Tickets are on sale now. Winners at the AMAs reflect voting in the Austin Music Poll, which features 52 categories. Industry-specific honors. The Austin Music Industry Awards precede the AMAs on Sunday, Feb. 17, at Emo’s, hosted by yours truly and Riverboat Gamblers/Drakulas frontman and funny guy Mike Wiebe. Long shepherded by late local music lynchpin Margaret Moser, the AMAs continue to grow in unprecedented unification of ATX music industry entities. The Austin Chronicle, South by Southwest, Stratus Properties, C3 Presents, Margin Walker, Circuit of the Americas, Austin Music Movement, KUTX, Giant Noise, the Clifford Antone Foundation, the Recording Academy, SexHawkeBlack Records, YepRoc Records, Kessler Presents, and Gibson Guitars are all sponsors and/or partners in the AMAs. So are Arts+Labor, Hotel San Jose, Texas Music Water, Hotel Van Zandt, Mayor Steve Adler, Tito’s Vodka, Treaty Oak Distilling, Prosperity Bank, Creative Action, Skull Island Studios, Becky Beaver, Yeti, Lyft, Gem & Bolt Mezcal, Torchy’s Tacos, Austin Java, and Homeslice Pizza. Credits having rolled, stay tuned for the official reveal of Austin Music Awards winners, including Musician of the Year, Band of the Year, Song of the Year, and so much more. Those results are being tallied this week, so even we don’t know who’s won yet! Given the diversity of nominations, chances are we’ll be as surprised as y’all are.